As Flappy Bird continues to wing its way to success on the App Store, a number of clones have appeared. Among them is Flappy Plane from developer Sungsoo Jung. Instead of a bird, you're controlling a plane, avoiding walls and other dangers by flying around them. On that note, here are some tips to improve your score. Before you start, you'll have the option to select between easy and hard settings. Go with Easy, as this'll decrease your speed while you get the hang of the game's controls. Once you think you're good and prepared to avoid walls like a pro, go ahead and bump up to Hard. Just be warned - things are going to come at you a lot faster. Similar to the Ironpants game we covered earlier this week, Flappy Plane uses a simple control scheme. Hold down your finger on the touchscreen to make your plane go up, and release it to make it go down. It helps to keep a consistent balance of tapping the screen to keep your plane from hitting either the ceiling or the floor. You'll get the hang of this technique within the first few rounds. As we advised with Ironpants, it's vital to keep your plane in a good central point of the level so you can prepare for any walls or obstacles that come your way. Stay in the middle as much as possible so that you can either glide above or below an object, and then return to that point once you've cleared the object. You'll thank us later. 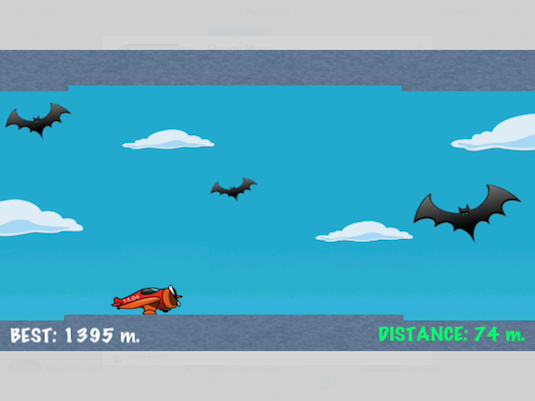 One of Flappy Plane's weaker points - and it's hard to ignore - is its collision detection. There will be times you think you clear a wall completely - and the plane isn't even touching it - and the game will end, because somehow, you came into contact with it. We suggest avoiding these objects entirely. If you want to avoid going back to the main menu and head straight into the action, hit the fast forward button when it pops up on the Game Over screen. By doing this, you'll return to the game immediately. It's best to be ready for it, though, or you'll crash right away. Last but certainly not least, remember this is a game that builds on punishment. You'll crash often - and sometimes unfairly - and that's sure to frustrate. Remember that taking breaks is vital so you don't lose your mind or throw your precious iOS device across the room. Take a deep breath and return to it later. This Plane will always be ready for take-off.